As a part of the effort to solve the unavailability of modern Hepatitis C drugs, REDEMPTION-1 clinical trials were conducted in order to determine the safety and efficacy of generic direct acting antivirals (DAA) to treat Hepatitis C. The trials were lead by Dr. James Freeman of FixHepC Buyers Club who gave a presentation on the outcomes of the trial at the most important event for liver-based diseases - The International Liver Congress 2016; an event gathering over 10,000 medical and scientific experts from all over the world was held in Barcelona, Spain. Here below is Dr. Freeman's presentation with added explanations. You can download full version of REDEMPTION-1 clinical trials below (see attachment). As Dr. Freeman neatly put it, the discovery of the modern Hepatitis C drugs that consist of DAA rivals the invention of penicillin by Alexander Fleming in 1928. What is interesting in this analogy, is that penicillin became widely used only in 1942 during the WWII. The DAA treatment is currently available to anyone - with deep enough pocket. Out of estimated 150 million Hepatitis C patients, only 500,000 are treated with the DAA annually. That is less than 1%. Of the Top 5 major causes for infectious disease, Hepatitis C just might be the one that is known the least. However, with the revolutionary DAA treatment making headlines, Hepatitis C awareness is slowly building momentum and the true scope of problems connected with Hepatitis C are becoming more obvious every day; as is the problem of the high prices of branded Hepatitis C treatments. We have had effective treatments for all of these diseases except Hepatitis C for more than a decade. It was in late 2013 that first DAA molecule called sofosbuvir was launched which should in effect greatly improve the world's Hepatitis C statistics by curing Hepatitis C patients. After all, the new Hepatitis C treatments have a cure rate of about 95% with minimal side effects. 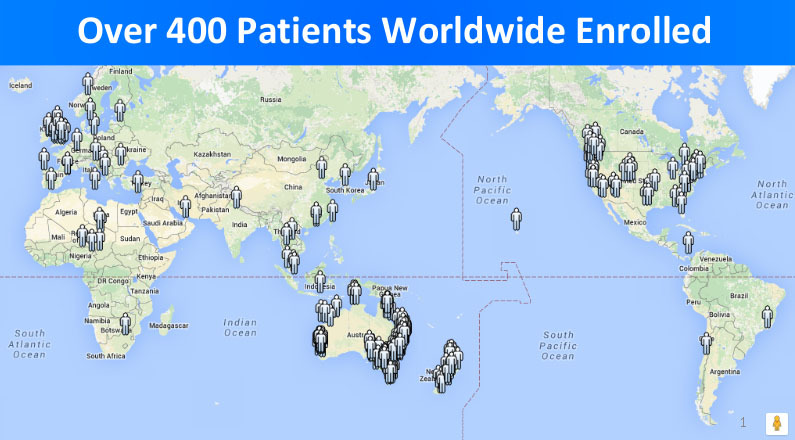 "If we have 150 million patients, why do we treat only 0.5 million of them? Especially with another 0.5 million patients dying every year." The answer is pretty obvious as well. The problem is the high cost of treatment. 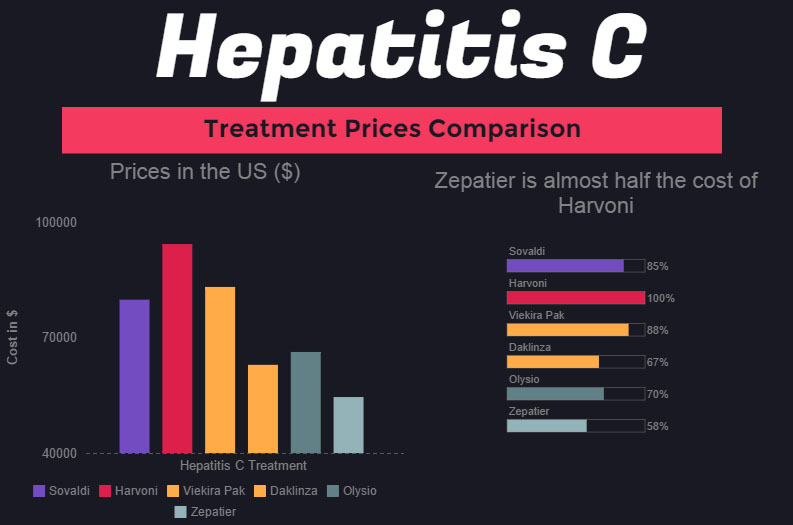 Big Pharma is apt to increase prices of innovative drugs; nonetheless, the Hepatitis C treatment area is another problem altogether because of the very extremes Big Pharma went to price Hepatitis C treatments that are of questionable innovation and are not based on production costs of manufacturing DAA-based pills. Here is an illustration by Dr. Freeman about how the new standard sofosbuvir-based Hepatitis C treatment costs, and what are the actual production costs for making it. 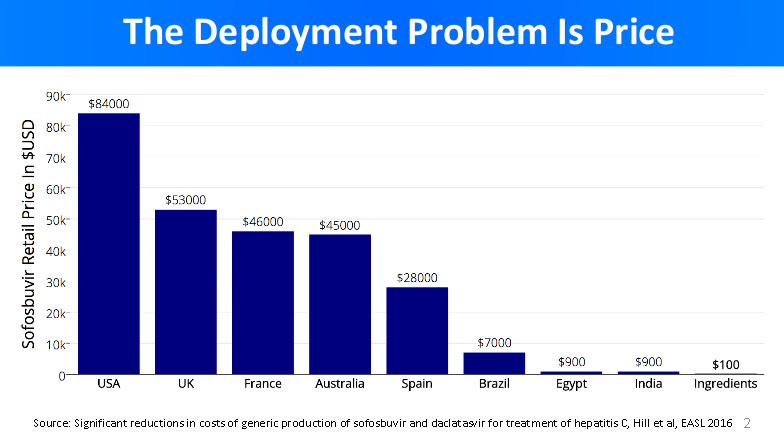 From the graph above, it is clear that Hepatitis C treatment pricing has nothing to do with the cost of ingredients. Pharmaceutical companies spend $100 to produce Hepatitis C drugs, and sell it for outstanding $84,000 (US price). This incredible margin indirectly translates to 500,000 death every year. Paradoxically, the discovery of an effective Hepatitis C cure brought more problems than it solved due to how Big Pharma operates. There is a way around Big Pharma. One of the main objectives of REDEMPTION-1 clinical trials is to provide a scientific basis for treatment with the generic DAAs. It was designed to prove a patient can be cured using the low-cost generic DAA as effectively as with $84,000 priced branded medicines. Generic DAAs are basically the main therapeutic ingredients that branded Hepatitis C medicines are made of. It is important to understand that DAAs hold all of the therapeutic effect; pharmaceutical companies usually add sugars and other non-therapeutical ingredients to transform DAAs in powder form into a pill; a product most of us are used to. According to the study, generic DAAs such as sofosbuvir, ledipasvir and daclatasvir are being mass produced for 1% of the current US price of final products. By using these DAAs for treatment, we can forgo 99% of costs connected with Hepatitis C treatment. However, in many cases legality of using the low-cost generic DAA is put under question. These issues are very important when it comes to obtaining low-cost treatment and were addressed at the International Liver Congress 2016 in Barcelona. Dr. Freeman pointed out that according to the governing laws of Australia, the UK and other countries, an individual patient has the right to import the maximum of 3-months worth of supply of medicines intended exclusively for personal use. In the pharmaceutical industry, usually the Big Pharma has patents on therapeutic molecules lawfully giving them monopoly power and privileges. The Hepatitis C treatment are no exception; DAAs such as sofosbuvir, ledipasvir and daclatasvir are all protected by patents. Nonetheless, World Trade Organization's Agreement on Trade-Related Aspects of Intellectual Property Rights (TRIPS) provides a basis why importing Hepatitis C medicines such as generic DAAs is legal. "Members may exclude from the application of the above provisions small quantities of goods of a non-commercial nature contained in travellers' personal luggage or sent in small consignments." The quotes article states that the TRIPS laws exclude the import of small quantities of non-commercial goods. A Hepatitis C patient travelling out of China with generic DAA pills in his backpack for personal use is an example of practical application of De Minimis Imports article. This also provides a legal basis for fixhepc.com to provide Hepatitis C patients with access to medications and helps them by discussing the treatment on-line. Credible generic DAAs as treatment. Hepatitis C patients as subjects. Generic DAAs were obtained and their quality was evaluated with advanced pharmaceutical techniques such as HPLC, NMR and Mass Spectrometry. 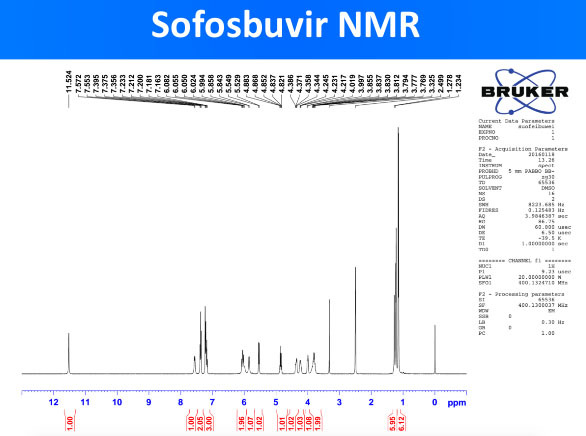 To a trained eye, the results obtained (included below) prove that the obtained sofosbuvir DAA has a molecule structure expected from sofosbuvir molecule. This confirms the validity of the generic DAAs used in the REDEMPTION-1 trials. The peaks in the NMR spector above correspond to specific hydrogen (H) atoms within the molecule of sofosbuvir and confirm the structure of the whole molecule. NMR is a standard technique for obtaining the molecule structure of small therapeutic molecules such as DAAs. In order to determine the effectiveness of the obtained generic DAAs, Hepatitis C patients were recruited via http://fixhepc.com/ website. With the help of Dr. Freeman, more than 400 patients were assisted in making a personal importation of the affordable Hepatitis C medications. As one can clearly see, the patients from all over the world were included in the trials. 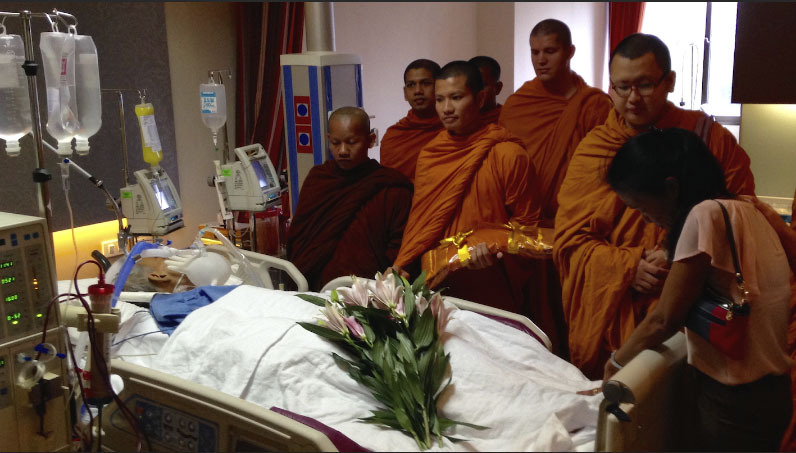 Each of them were given an assistance in legally importing the verified generic DAA treatment for an affordable price. This system presented the basis for assessing the safety and efficacy of the generic medication legally imported by Hepatitis C patients. It is well known that there are 6 genotypes of Hepatitis C virus and each of them is treated in a respective manner with a selection of generic DAA. From the poll of over 400 Hepatitis C patients, Dr. Freeman presented the statistical data about the patients involved in the trials. The statistical data above reveals that the average age of Hepatitis C patient in the trials was 54.4 years. About half of the patients were naive - meaning they received no previous Hepatitis C treatment, and about 30% of them have already suffered liver cirrhosis. The most predominant genotypes in the trials were genotype 1 (63.9%) and genotype 3 (27.5%), and the most predominant manner of treatment was sofosbuvir+ledipasvir (45.8%) and sofosbuvir+daclatasvir (42.6%). The objective of the trials was to evaluate the safety and efficacy of generic DAA treatment and compare them with published data from Phase III clinical trials of existing branded Hepatitis C treatments. The main parameter for measuring the efficacy of Hepatitis C treatment is the decrease in the viral load over time. In the graph below, we can see the comparison of how quickly does the HCV viral load decrease in patients treated with the generic DAA. Added to the graph are the results of Phase III clinical studies of how quickly did the HCV viral load decreased in patients using branded medicines. Reading the graph, it is important to see that when Log Viral Load reaches 1, there is no more HCV virus present (since log(1)=0). 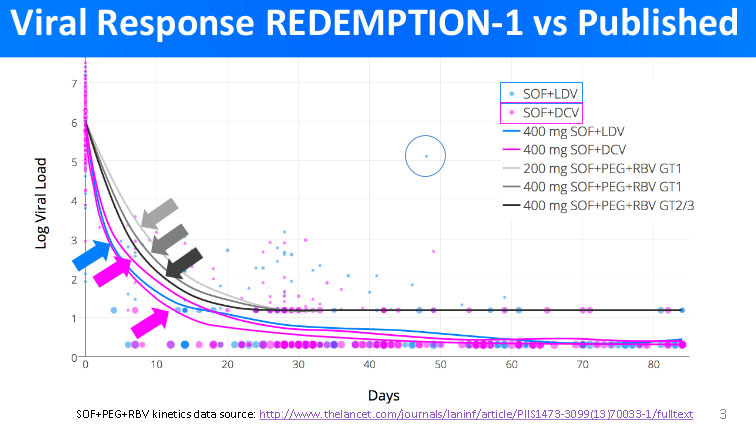 The results of REDEMPTION-1 trials clearly indicate that the decrease in viral load in patients treated with generic DAA is as quick, or in some cases even quicker, than in patients treated with branded medications. This confirms the premises that the efficacy of generic DAA treatment is comparable to that of the treatment with branded medications. 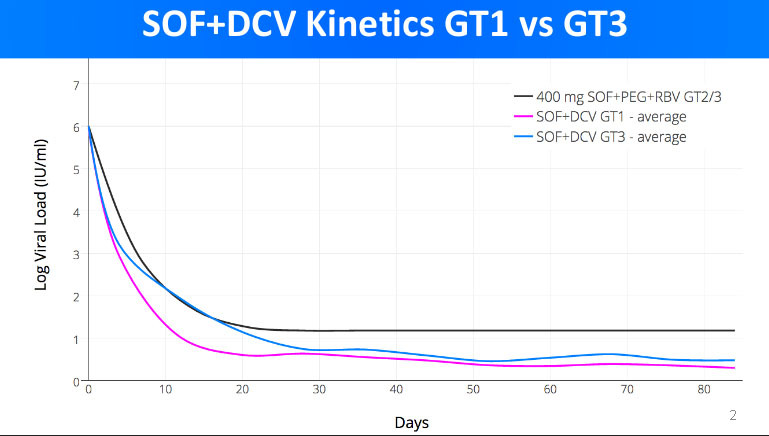 Here is a more detailed look of how generic DAA treatment combination sofosbuvir+daclatasvir is fighting off HCV in patients with genotype 1 and genotype 3. As we can see, the viral load of genotype 1 patients has decreased to 0 (Log Viral Load = 1) faster. In average, it took about 14 days of treatment for genotype 1 patients to be free of HCV. For genotype 3 patients, the zero viral load was achieved in about 30 days. In both cases, the sofosbuvir+daclatasvir combo was proven to be very effective in curing Hepatitis C.
What was the cure rate in REDEMPTION-1 Trials? A parameter that is observed when we want to determine if a patient is cured of Hepatitis C, is the viral load (HCV RNA). 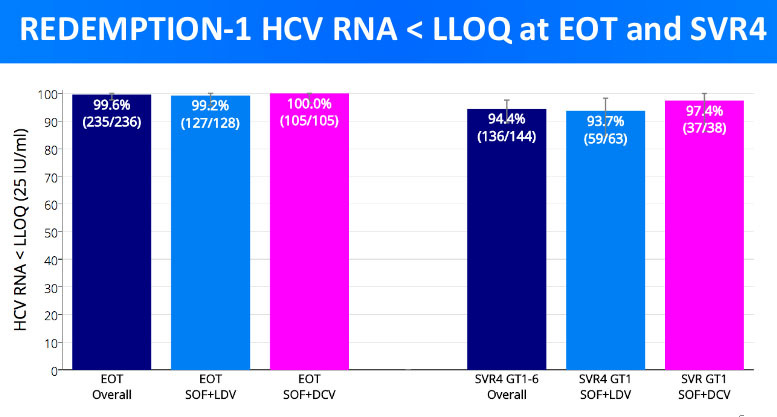 If we cannot detect the genetic material RNA of HCV in the performed test (this means that the content of HCV RNA is below the lower limit of quantification (LLOQ)), we count such a patient as cured. However, some patients who show zero viral load at the end of treatment (EOT), will in some weeks again suffer from Hepatitis C. Some of HCV viruses were not destroyed and evaded detection; without treatment they will multiply and we will again see their presence via measuring the viral load. At the end of the treatment, the resulting cure rate for the most prominent treatment regimens was 99.6%. Out of 236 patients treated, only 1 still showed a non-zero viral load at the end of the treatment. The viral load of the rest 235 patients was zero. 4 weeks after treatment, however, some patient experienced the Hepatitis C recurrence. 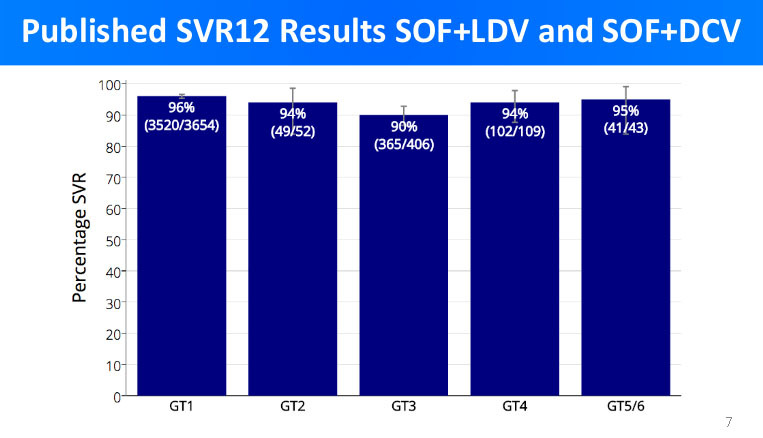 From the data for GT1 above, we can see that the treatment combo sofosbuvir+ledipasvir went from being 99.2% successful to being 93.7%. This means that in 5.5% of patients treated in such a way, Hepatitis C came back. On the other hand, sofosbuvir+daclatasvir combo was more successful - the cure rate after 4 weeks fell to 97.3% from 100%. Essentially, only 1 patient with GT1 treated in such a manner suffered from Hepatitis C recurrence. 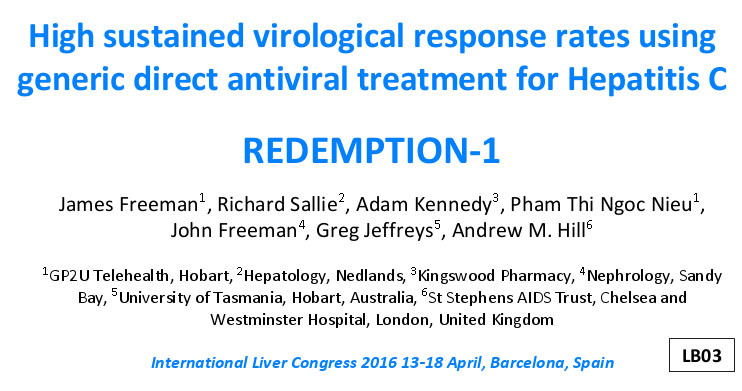 The REDEMPTION-1 trials main objective is to scientifically prove that the generic DAA medicines patients can purchase for about $1,000 are equally successful in curing Hepatitis C as branded medications for which the US patients have to pay $84,000 or more. 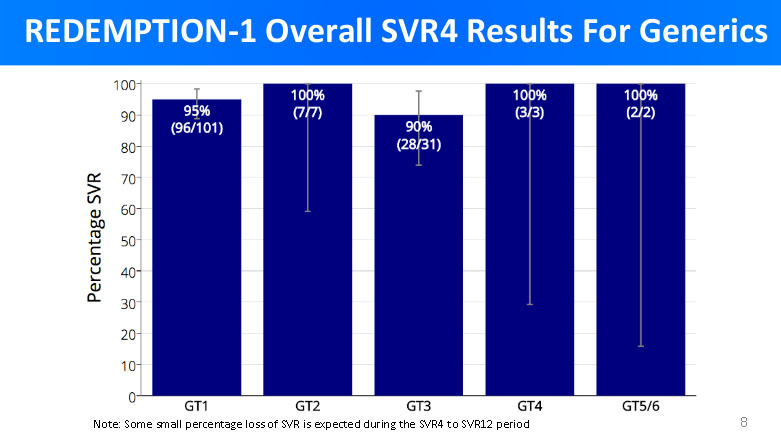 The overall cure rate was observed via parameter SVR12 - sustain virological release measured 12 weeks after the end of treatment. It is a consesus that SVR12 is a true measure of Hepatitis C medication efficacy. 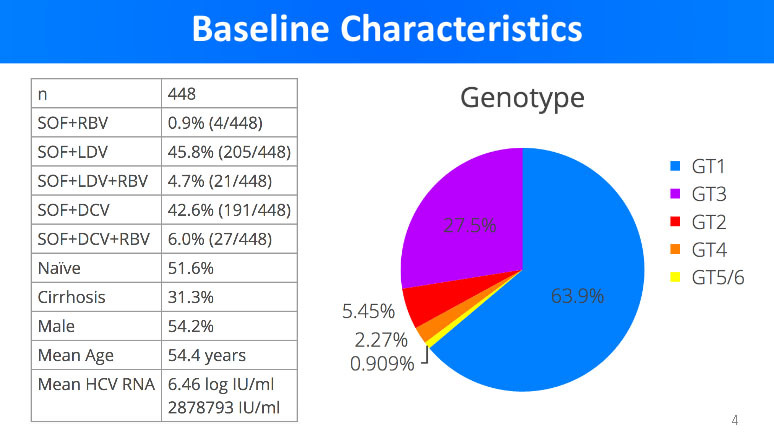 In the graph below are the cure results of branded medications for each genotype. Here are the cure results as obtain with generic DAA treatment in REDEMPTION-1 trials. By comparing the above graphs, we can see that the cure rates in branded medicines treatment and low-cost generic DAA treatment are very similar. This is the confirmation of REDEMPTION-1 trials objective. Accordingly, we see less than 6% difference in cure rates between branded medicines and low-cost generic DAA; what is more, in more cases the treatment with generic DAA has proven to be even more successful than with the branded medications. Dr. Freeman also addressed safety evaluation of the generic DAA treatment. 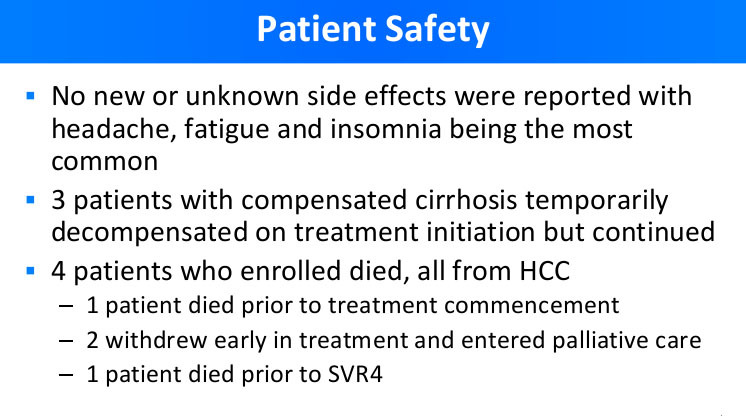 As you can see from the presentation slide below, the safety profile of patients included in the study was comparable to the findings of Phase III clinical studies for respective branded medications. The successful REDEMPTION-1 trials have proven that the Hepatitis C treatment with the generic DAA is as effective and safe as with branded medications. Generic cure for Hepatitis C is as effective as branded medications, and it only costs $1,000. The successful trial is being praised all over the news. Here are some stories about how the REDEMPTION-1 trials might influence Hepatitis C treatment in the future.